NOAA GOES-13 satellite imagery of Hurricane Maria on Sept. 21, 2017. Update Sept. 22: Hurricane Maria is currently a massive Category 5 storm as it heads toward the Virgin Islands and Puerto Rico. National Oceanic and Atmospheric Administration (NOAA) satellites have been capturing imagery of Maria since it first began to form in the Atlantic Ocean. International Space Station cameras were also used to observe the storm. Scroll down to see the latest videos of the storm from space. Learn more about Hurricane Maria from our sister site Live Science. Time-lapsed satellite imagery of Maria from Sept. 19 to the early morning hours of Sept. 21. 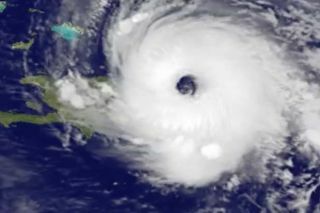 Maria was a dangerous category 4 hurricane when it made landfall in Puerto Rico with 155 mile per hour winds according to the National Hurricane Center. NOAA's GOES-13 satellite captured imagery of the the storm from Sept. 18-20, 2017. External cameras on the International Space Station captured imagery of the storm on Sept. 19, 2017. NOAA's GOES-13 satellite captured Maria intensify from a Category 3 to Category 5 hurricane on Sept. 18, 2017. As of early morning on Sept. 19, the storm is back to being a category 5 hurricane, after briefly losing strength. NOAA GOES-16 satellite's Advanced Baseline Imager (ABI) captured imagery of the eye of the storm on Sept. 18, 2017. NOAA's GOES-13 satellite captured imagery of the storm from Sept. 15-18, 2017.